I apologize in the dust gathering on this blog. I hope to be posting a lot more in the weeks ahead. In the meantime, here’s a Christmas wish I whipped up with the help of Congressman Jack Kimble of California’s 54th District. Please excuse me for the tone of this particular blog entry. It seems I ran out of egg nog and have been drinking straight rum since 2PM. Anyway, Christmas Eve is the tradition for me. I get my daughter Emily for Christmas Eve and it’s beautiful. This year she got me a talking Ronald Reagan action figure and I got her an elliptical machine. It can be difficult giving the practical gifts and letting her mom give her the stuff she actually wants, but at only 5’7″ and tipping the scales at 120 pounds, I think she can really use the exercise machine. I love my Ronald Reagan. I always spend Christmas Day the same way–watching the movie Taxi Driver. I’ve seen it 4 times so far today and I think I’ll put it in another before bed. I really love the movie and it’s become such a Christmas tradition since my wife left me. I’m sorry to say that Christmas kind of stinks anymore because it’s become a socialist holiday. I remember when I was a kid, I didn’t get anything from Santa 4 times before the age of 10. The reason is, my father didn’t think I was very good those years. Nowadays kids just expect that they’ll get a toy every year. This rum is really good. Christmas (or for my Jewish readers Hanukkah) gives people the feeling of renewal–the belief that mankind can be saved by a small child. 2009 may not have been a great year for many of us, but I hope that 2010 will find things much improved. Your presence on this blog has been a great gift for me and if you might tell a friend or two about it, it would be even sweeter. 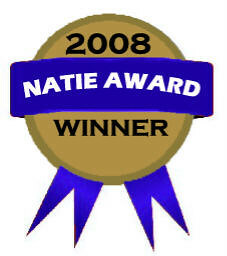 In the next week we’ll find out the nominees for this year’s Natie awards celebrating the best in blogging over the past year. Remember the story of it’s a Wonderful Life and how much good one man can do if he’s willing to give up on world travel to get into banking and give mortgages to people that other banks believe are too risky. To all my constituents in the 54th District and throughout the country, I wish to extend my warmest Christmas wishes to you and yours. While some of you may not be Christians, I feel perfect comfortable wishing you a Merry Christmas because Jesus saved all mankind and not simply Christians. To Jews who celebrate Hannukah on the 25th, I wish you a blessed day on the most sacred day on the Jewish calendar. I think the fact that both Christianity and Judaism celebrate the exact same day says a lot. It is important we respect all religions as Christianity is not the only path to the light of Jesus Christ. I know how truly blessed I am to be able to be a congressman for the greatest district in the greatest country in the world. In the year ahead, we must all make an effort to stand up and be counted. It doesn’t matter if you have expensive clothes, or a fancy high school diploma, or even all your teeth. Until the Democrats in Congress and the White House hear from the everyday people in this country, they will continue to try and provide government health care and other services with our hard earned tax dollars. When the government gives it’s people the most basic necessities of life, it can also take them away. This is what socialism is all about. Have a joyous holiday and a blessed 2010. I will continue to try and fight the good fight in Washington, but we definitely need the help of the people back home if we are to put this country back on the right path it was on under President Bush. This Christmas Card feels like it could be the last one I ever send. Like gun ownership, private health care, and anything that gives me joy, it has a most tenuous existence under the reign of Barrack Obama. I have to wonder, why does he hate the Baby Jesus so? 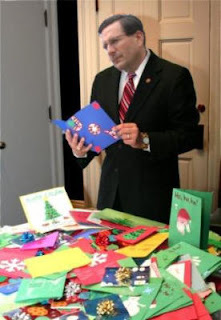 I promised Emily that I would not dwell on politics for the entire Christmas letter again this year, but I really fear for our country’s future. Last year’s red eye and watery puss is thankfully gone. Unfortunately, this Summer was the Summer of shingles. It wasn’t as much a rash as a tingling sensation in my legs, but my glands were so swollen I looked like a puffer fish. I recovered in time to receive an honorary associate’s degree from Sawyer Community College. This Fall has been much better although I’ve been going through Imodium like candy, due to recurring diarrhea. I hope that you all have been blessed with great health this year. Emily finally lost 5 pounds. She has such a pretty face and I think if she could drop another 15 and get down to 105 or so, she’d be much happier. At 5’7″ she just shouldn’t be tipping the scales at 120. She’s adjusting well to the 7th grade and has a crush on Tom Newman. Since Tom’s family gets this letter, maybe this will bring the two of them together. I bet if he talked to her about losing weight it would help. Last year I mentioned that Emily was getting her period and I can confirm that she is definitely growing up. This hasn’t been a great 2009, but I have huge plans for the future. In the weeks and months I’ll be calling most of you to tell you all about a fantastic money making opportunity. I am convinced that in the years to come, the smoothie and juice bar market will be booming. As a friend of mine or family member, I am able to set you up with your own smoothie and juice bar franchise. We can have you opened and operational just in time for the Summer. I’ll tell you more when I call. The storage business has been great, but I’ve had to hire more security. The way we’ve thrived in this rough economy is by increasing the amount of stuff we’re selling from customers who fell behind on payments. Unfortunately, we’ve had a problem with people showing up a few days late and trashing my office when they find out their stuff is gone. I’m sorry, but 1st of the month is 1st of the month. The worst is when they get angry about sentimental value. If I can get $5 for a painting of your parents, hey I’ve got to make a buck too. I am finally over Kimberly, but it is so hard just to meet a nice professional woman between 21 and 28. I’d consider an older woman, but you know how woman my age let themselves go. Its been 8 years since the divorce and I am still a bit bitter about it. The details are available assuming you kept past Christmas letters, but the only decent thing to come out of my marriage is Emily. She’s still a straight A student, but it’s time for her to quit experimenting with liberalism. I blame her school for that the same way I blame her mom for the genes that make her bloat and retain water. I’ve been trying to keep in touch with the extended family. Aunt Patty and Walter are doing better since Patty broke her hip in May. That’s tough for a woman her age and I hope they have some quality of life yet. If I break a hip at that age, just shoot me (Patty and Walter, I’m sure you have a long and happy life ahead of you). Larry Peele got out of prison in Summer and unfortunately, was back in by Fall. I think he’s got a great case for entrapment. Katie continues to drive the boys crazy, while getting straight A’s and captaining cheerleading. I wish her and Emily were closer. I think she could teach Emily a lot about making herself more presentable. Steve and Janet moved out to Texas. Steve is still a pest on my blog. I guess in the Christmas spirit we can wish the Catholics a Merry Christmas too. They’ll have plenty to explain in the afterlife as well Barrack Hussein Obama. I had to fight with Kimberly over it, but I will have Emily for Christmas Eve. Then it’s my annual Christmas Day Taxi Driver marathon. I watched it 6 times last year, but that’s nothing like the 9 times I watched it the year that Kimberly left me. I hope you and all your families have a Merry Christmas and a terrific 2010!! Finally, us Christians seem to be winning the War on Christmas. There were two news stories that caught my eye this week and both spelled overwhelming victories for the forces of good and decency. First, was Senator Orin Hatch. Hatch who is a Christian (or at least a Mormon) has recorded a video for his song Eight Days of Hanukkah and it looks like a winner. For years now, Jews have been encroaching on our Christmas music for years. From Irving Berlin with White Christmas to Barbara Streisand and Neil Diamond recording Christmas albums. No wonder the holiday became so secularized. Even Bob Dylan recorded a Christmas CD this year. Let’s see how they like having their holiday music created by a Mormon. Now please don’t write in accusing me of being anti-Semitic, nothing could be further from the truth. Just as Christians were given Jesus to bring us all the gift of eternal life, Jews had their lamp oil last for 8 whole days. That oil thing is pretty cool. The other story I saw involved the fine folks at Boss Creations.Net who have invented the Christ-mas tree. 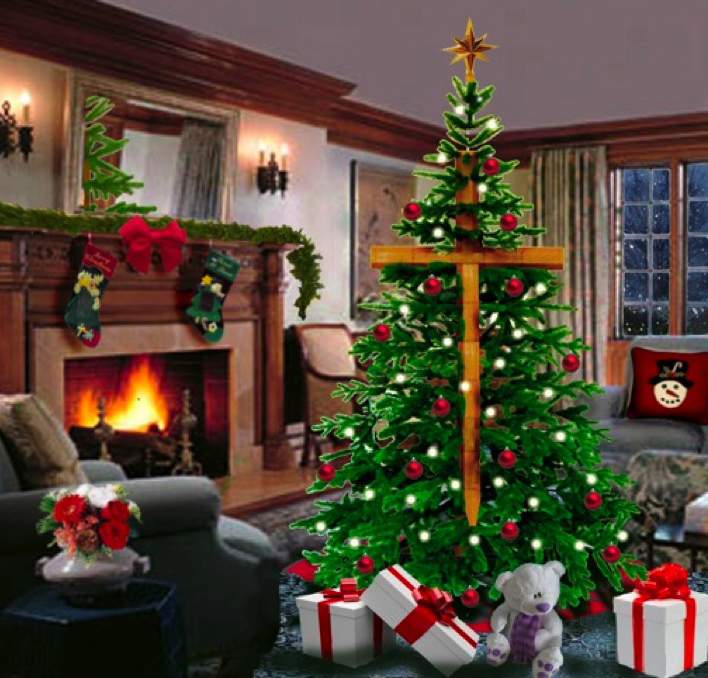 This particular Christmas tree is a combination between a traditional Christmas tree and a rugged wooden cross. It isn’t only a great conversation piece, but also a reminder that no matter how festive your Christmas tree may be, it’s only a group of judgmental pharisees, some nails, and a hammer away from a crucifixion. I always thought that in the rush to blame the Jews for crucifying Jesus, that the wood itself got off way too easy. We’re so eager nowadays to embrace nature that we forget about some of the truly despicable things from the crucifixion through lynchings, that tress have been responsible for. 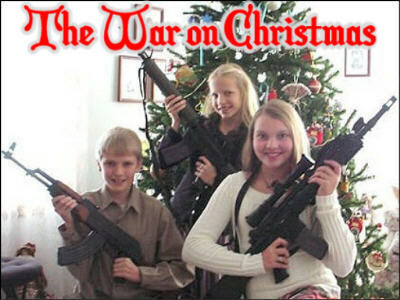 The War on Christmas is far from over, but for the first time in a long time, it looks like we’ve got the upper hand. Christians 1, Trees 0.